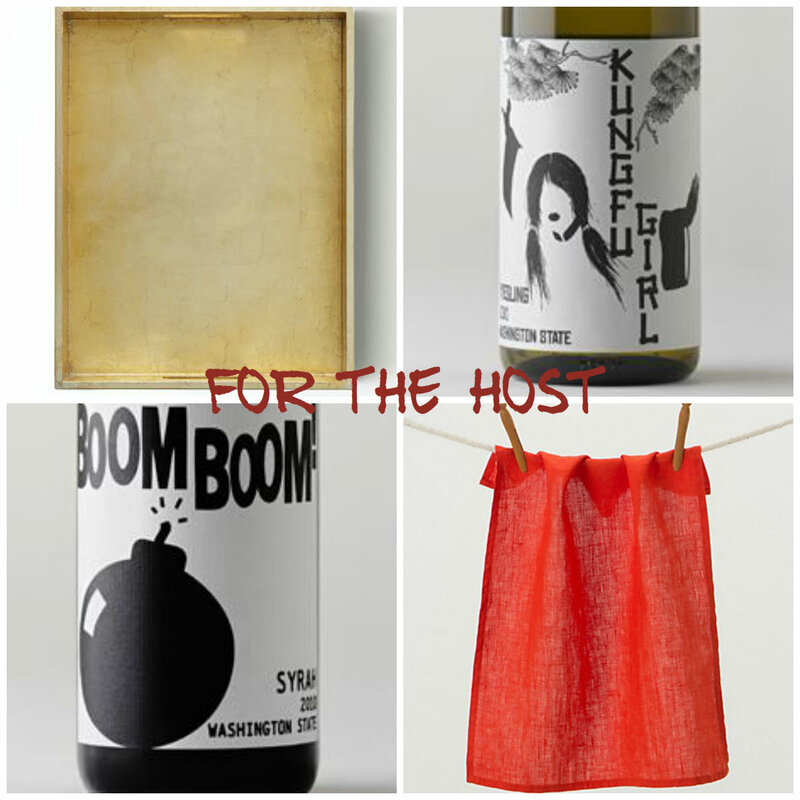 Surprise your holiday host with this new take on giving wine. Instead of using a wine bag – or walking up the door with it in hand – use a tray and if size allows, give a red and white wine. Trays for entertainers are indispensable and make great decor accents when not in party mode. Even if the wines are not used for the party, your host will appreciate having the choice of two wines for another time. Cut a paper bag open, removing the handles and bottom bulk. Or, if available, use butcher paper or a heavy wrapping paper. Crumple the paper and use it as padding in the tray to prevent the bottles from rolling around. Test it out by placing the bottles on the paper, making sure they’ll be secure. Cut away excess paper if needed depending on the size of your tray. Cover the paper with the dishtowel, tucking the sides and corners under the paper. You may need two towels depending on the size of your tray. Nestle the wine bottles into the tray. Ta-dah! Your gift is ready. Want to add little something extra? Tie together long sprigs of rosemary and place the bunch between the bottles. Kraft butcher paper is in fashion so could you can skip the towels easily. Tie a bow around the bottle necks to add a personal touch. You can also create a pattern on the butcher paper using stamps or glitter glue (allow to dry before crumpling). For some great ideas on creating patterns on paper, check out this article. For more wine ideas, check out these great NW Wines. And be sure to follow our Holiday Gift Guide on Pinterest for the latest and greatest this holiday season!